Hopefully Amazon will fix so there is no confusion. Later this month (and I'll post when), the first of my Immortals books will be offered free from Borders. Stay tuned! I appreciate all the support of my readers, and I just want to reassure everyone that I am not going away! :-) I'm writing for Berkley now, and all my series will continue in mass market paperback (as well as ebook). Lady Isabella's Scandalous Marriage was a strong release in July (with Berkley), and I'm looking forward to Primal Bonds (Shifters Book 2) with Berkley in March. I'm also writing more than ever! I'm working on Cam's and Hart's books for the Mackenzie series (out next year), Shifters book 3, and plenty of Allyson James stuff, both at Ellora's Cave and Berkley. 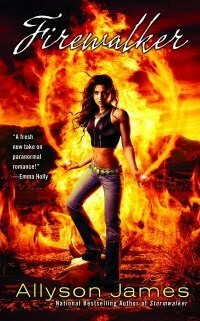 (Firewalker will be out in November 2010 from Berkley.) Plus I'm looking to revive my mystery series as Ashley Gardner. I appreciate everyone's support during this tough time, but rest assured, I'm not finished! I have much more to write, and it's all going to pour out the rest of this year and on through 2012.